For the first time, statements by Jared Kushner, the US president’s envoy to the Middle East, revealed some aspects of the US Middle East peace plan, sometimes known as the “deal of the century”. Kushner’s statements triggered a barrage of reactions, especially after he announced that all the details of the new plan for peace to end the 70-year-old Israeli-Palestinian conflict will be released after the Israeli elections. Kushner only gave a broad outline of the US peace plan; the core of the solution remains a mystery. He spoke about freedom, respect, security, marking borders and balancing the political and economic tracks as some of the features of the plan. However, for Palestinians these components are not a formula for a solution since they did not mention ending the occupation, halting and removing settlements, creating a Palestinian state with East Jerusalem as its capital, and the US reversing its decision to recognise Jerusalem as the capital of Israel. Ahmed Majdelani, a member of the Executive Committee of the PLO (Palestine Liberation Organisation), pointed out that Kushner did not mention a Palestinian state within the 1967 borders, the right of return, or Jerusalem, or settlements. What little is known of the US peace plan so far is unacceptable to Palestinians because it does not mention international resolutions and law, or the right to self-determination, ending the occupation and creating a Palestinian state. Palestinians believe that after relocating the US Embassy to Jerusalem and recognizing the city as the capital of Israel, Washington is no longer an impartial sponsor of peace and Palestinians will not participate in a plan that is so far from the essence of the Arab Peace Initiative which is based on ending the occupation as the key to peace. 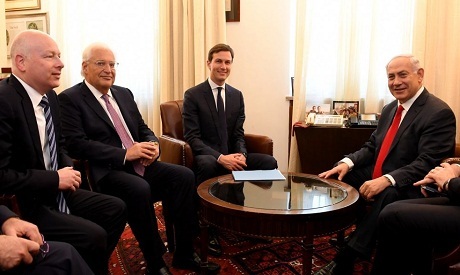 Saeb Erekat, secretary-general of the PLO’s Executive Committee and senior Palestinian negotiator, said it is vital to understand who else is travelling with Kushner and US envoy to the Middle East peace process Jason Greenblatt. The delegation also includes Brian Hook, the US official in charge of the Iran file, who along with National Security Adviser John Bolton, promotes that Iran poses an existential threat to Arabs. “There is an overlap,” said Erekat, noting that Kushner’s wording that the plan promises a better life for everyone implies that the plan is not so much political as simply improving of living conditions. Erekat asserted that for Palestinians it is not a matter of improving living conditions or freedom of movement, or supporting the Palestinian economy, but rather ending Israeli occupation, creating a Palestinian state within 1967 borders with East Jerusalem as its capital, and Al-Aqsa Mosque and the Church of the Holy Sepulchre within its walls, resolving final status issues, most notably the plight of Palestinian refugees, UN General Assembly Resolution 194 and releasing detainees. Erekat said these are the same conditions that the US dictated to Palestinians in order to join the peace process in 1988. He continued that another statement by Kushner that all issues will be addressed based on realities on the ground in 2019 means forgetting about a Palestinian state within the 1967 borders, dropping the issue of Jerusalem (which Washington has done already), refugees, settlements, and creating an independent Palestinian state. On top of all this, Arabs are also expected to fund the plan wherein Al-Aqsa Mosque is under Israeli sovereignty, he said. Erekat cautioned that anyone who accepts this is denying the existence of the Prophet Mohamed and denying Al-Israa wal Miiraj (the Prophet’s miraculous journey from Mecca to Al-Aqsa Mosque and then to heaven). Erekat added that the EU-Arab summit in Sharm El-Sheikh that was attended by 50 countries stressed that if a solution does not include a Palestinian state within the 1967 borders with East Jerusalem as its capital, based on international law and the Arab Peace Initiative, there will be no solution. He continued that when late Israeli prime minister Yitzhak Rabin began to take serious steps towards ending Israeli occupation, he was assassinated by an Israeli extremist. Also, a few days after maps were exchanged between Palestinian President Mahmoud Abbas and former Israeli prime minister Ehud Olmert, the latter was politically assassinated and toppled. Since Binyamin Netanyahu came to power in 2009, he has evaded all obligations in signed agreements, increased settlements by 40 percent, ended all obligations regarding the transfer of power and territories, and concluding final status talks. Netanyahu’s strategy is based on three pillars, explained Erekat. First, a Palestinian Authority without any authority; occupation without a price; and separating the Gaza Strip and the West Bank. “If we don’t accept this, they will use all means and ways to say that President Abbas must leave and that the PLO is illegal,” he argued. Israeli media reported that Tel Aviv is worried about the explosive situation in the West Bank that could amount to another Intifada (uprising) once the “Deal of the Century” is revealed. Alex Fishman, a military analyst writing for Yedioth Ahronoth newspaper who has close ties with Israeli security, quoted an Israeli politician as saying that a key official in the US administration who is informed and involved in the “deal” President Trump and a few of his advisers are working on, told him that after publishing the plan, any Palestinian family would be able to sit around the dinner table and read the plan and see whether it can be applied. They will put pressure on President Abbas. The senior Israeli official said he could not believe what the US official, who has been touring the Middle East since Trump’s election, was saying. The US official said the plan was written in simple terms without legal jargon, but also includes descriptions to convince the Palestinian audience of its merits, such as employment, funds, freedom of movement and a form of sovereignty. According to Fishman, the Israeli official warned against the dangers of releasing the plan, stating that combining naiveté and amateurism is a formula for disaster. He said Trump’s plan will hasten an explosion between Israel and the Palestinians, and warned that no professionals in the US administration who are experienced in the complications of the situation in the Middle East contributed to the “Deal of the Century”. The US State Department was excluded, and the small team from the National Security Council that is assisting Kushner and Greenblatt are confined to gathering data but were not involved in the final plan. The deal was written by Kushner, Greenblatt and US Ambassador to Israel David Friedman; the Palestinians were never consulted, he said. A research paper published by the Begin-Sadat Centre for Strategic Studies in Tel Aviv argued that Israeli withdrawal from the West Bank would be an existential threat to Israel. The paper, written by Reserve General Gershon Hacohen, stated that as the peace plan is delayed by Trump’s administration, any future withdrawal from the West Bank poses an existential threat to Israel. The military correspondent for Israel Hayom newspaper said that Hacohen’s research undermines the ideas of most current and former senior security officers, because his paper asserts that changing the formula of war over the past few decades from traditional confrontation between two armies, to confrontation involving civilians, requires Israeli presence in areas that have not been handed over to Palestinians. Hacohen explored several scenarios that could occur if Israel leaves Areas A and B in the West Bank. He warned that similar to what happened in South Lebanon and the Gaza Strip once Israeli troops withdrew, “terrorist” groups will convert the homes of Arab civilians in the West Banks into battle zones by planting mines on the streets and storing missiles in homes. Hacohen also warned against fighting on too many battlefronts at once, as expected today on the fronts with Lebanon and Syria, adding that simultaneous combat on the Gaza and Lebanon fronts is already a possibility, so what would happen once Gaza becomes part of a Palestinian state? He continued that the threat from a Palestinian state in the West Bank would put the Israeli army in a “very difficult position”. While many politicians and security officials in Israel support a separation from Palestinians, Hacohen believes that the current situation, whereby Israeli settlements deeply infiltrate the West Bank, is of great political and security benefit for Israel.